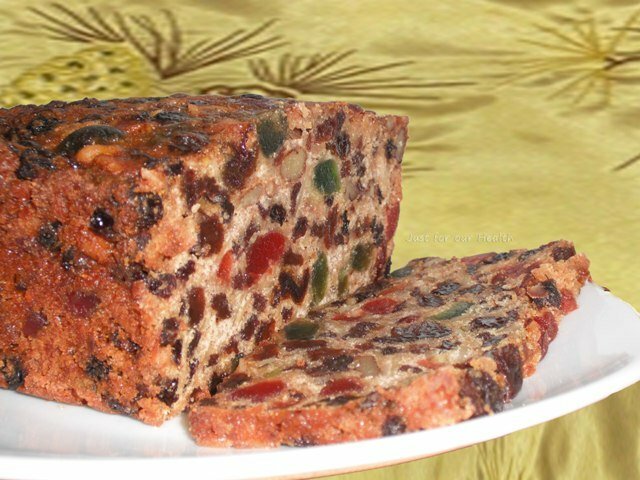 Often considered a holiday staple, there’s no need for those with food allergies and intolerances to miss out on a slice of delicious fruit cake this year! Place dried fruits into a container and pour brandy (or whatever you are using), plus the apple juice over the fruit, stir well, and seal the container and let sit overnight. Cook pitted prunes in about 100 ml of water slowly. Blend into a paste when soft. Next day, the paste will be thick. Warm the honey, and add to the prune puree. Add the oil and stir the mixture until blended. Add orange and lemon zest and stir into mixture. Pour prune mixture over the fruit. Place dry ingredients-flour, baking powder and spices into a large mixing bowl. Add the dried fruit and prune mixture. Stir until blended. In a separate bowl beat egg whites until light and fluffy but not stiff. Fold into the cake mixture. Mixture should be thick and of a dropping consistency. Add more juice if too thick. Spoon into oiled cake loaf pan. I recommend using two small sized ones. Cover with parchment paper and bake at 300F for 1 ½ -2 hrs until a wooden skewer ( or large toothpick) comes out clean. Cool for 30 minutes before removing from pan. Wrap in parchment paper and store in a sealed container when cool. I’m going to be spontaneously posting hormone-happy recipes until the New Year on the Yoga Goddess facebook page and I don’t want you to miss out! P.S. If you try this recipe at home please let me know how it turns out for you. And if you make any variations leave me a note below – Either way I would love to hear from you! my parents – but not anymore!